As the trend for more and more recording artists to record exclusive material for video games continues, this particular soundtrack distinguishes itself with a lineup of top-notch alt-rock acts doing covers of "1950s-era songs." 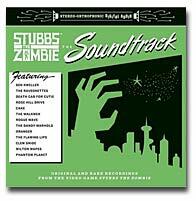 "Stubbs the Zombie: The Soundtrack"
Well, in fact, let's just say they're old pop songs dating back from the late '30s through the early '60s, all of them well-known chestnuts. How this all fits in with an action game released just in time for Halloween about a wisecracking, brain-munching zombie let loose in an American city circa 1959 is anybody's guess. But since he's the "rebel without a pulse," I guess that the songs provide a tongue-in-cheek contrast to all the bloody mayhem being gleefully let loose on screen. But, surprisingly for the most part, the young'uns play these songs straight and with a degree of reverence. Those acts that redo their songs appropriate to a video game soundtrack include the Dandy Warhols (a goofy take on the Everly Brothers' "All I Have to Do Is Dream"), Oranger (the Chordettes' "Mr. Sandman," rocked up several notches and complete with a theremin solo) and the Flaming Lips doing a free-wheeling, cartoonish version of "If I Only Had a Brain." The catalog of the aforementioned Chordettes is also mined one more time as Ben Kweller does a sweet, acoustic version of "Lollipop," complete with mouth pops. More venturesome bands offer up some intriguing versions of pop classics. The Drifters' jubilant "There Goes My Baby" sounds a bit more reserved and moody in the hands of the Walkmen. The same goes for a smoothed-out version of Buddy Holly's "Everyday" by the Bay area's Rogue Wave. Otherwise, Death Cab for Cutie do well with the doo-wop classic "Earth Angel," Cake does a lounge-y take on "Strangers in the Night" and the trio Rose Hill Drive chug through "Shakin' All Over" with an added Who-ish stutter (since that ol' band did its own rave-up cover of the Johnny Kidd classic). Phantom Planet chimes in with the only newly written track, the clangorous "The Living Dead." One track not used in association with the game, but instead on its promotional trailer, is the Angels' cautionary "My Boyfriend's Back." The Danish boy/girl rock duo the Raveonettes do an electrified version with production help by one of the song's original co-writers, the legendary Richard Gottehrer.